The last few times my niece M has visited, at some point in time some portion of the family has ended up being in a marching band. We grab whatever we have on hand to make pretend trumpets, cymbals and, of course, drums. 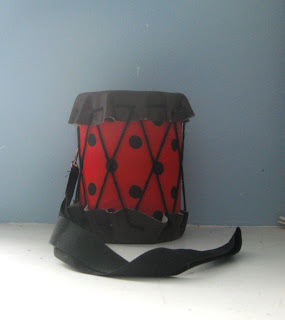 So when I saw this tutorial for a pretend toy drum, I knew I had to make it. It couldn't have been easier. I even added an old lanyard so that M can string it around her neck. Thus, making the marching part easier! This is now wrapped and under the tree. I'm looking forward to more parades in the near future! Cool! Yay! You are the funnest Auntie!